My lips get funky. It’s a fact of life some of us have to deal with. Never wanting to earn the nickname “Chappy” I’ve always tried my best to be on top of my game. 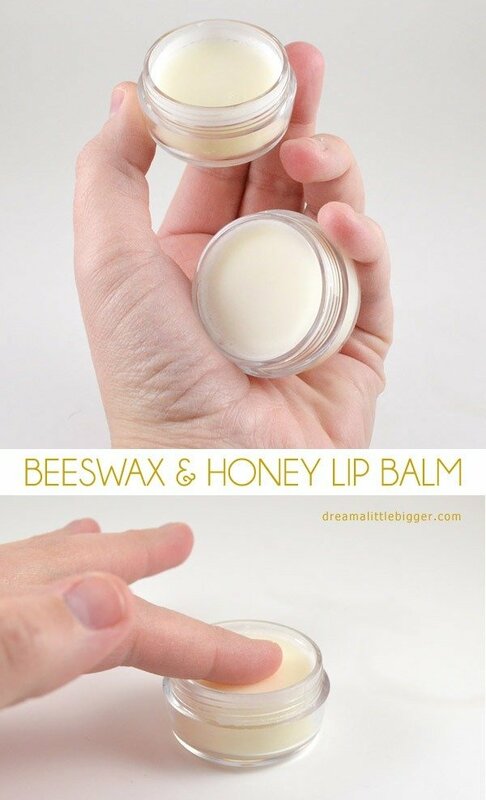 Some time ago I had gotten some beeswax lip balm that was very firm and actually took some rubbing to get to soften up to apply to the lips. 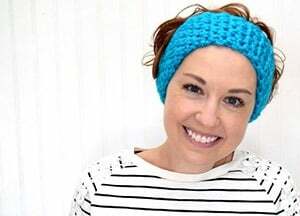 The thing that I noticed with it that after applied it almost seemed like I had on a protective barrier. This stuff was not just to have glossy, pretty lips but it made such a huge difference when dealing with freezing wind during the winter. 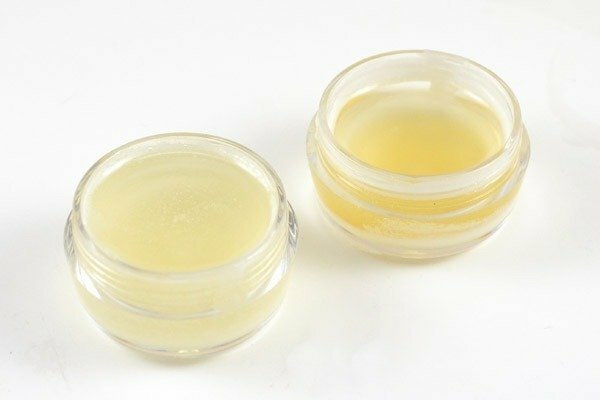 Since this balm wasn’t exactly cheap business, I decided to get into my crafty beauty supply making stash and see about making my own. Just in case you’re wondering what in the heck beeswax pellets are, here you go. 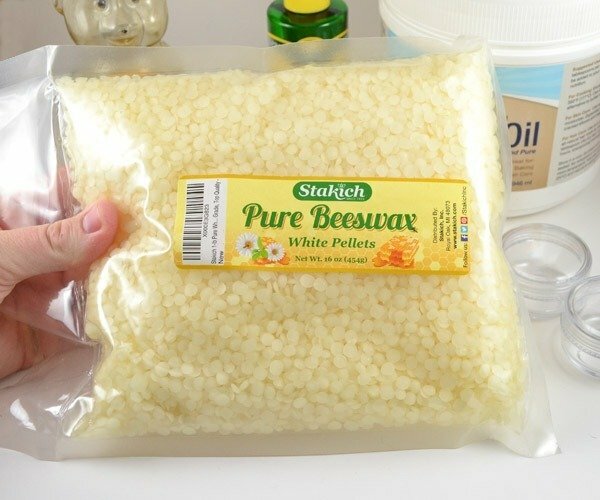 You can also go to buy this exact beeswax at Amazon by clicking on the link in the supply list above. 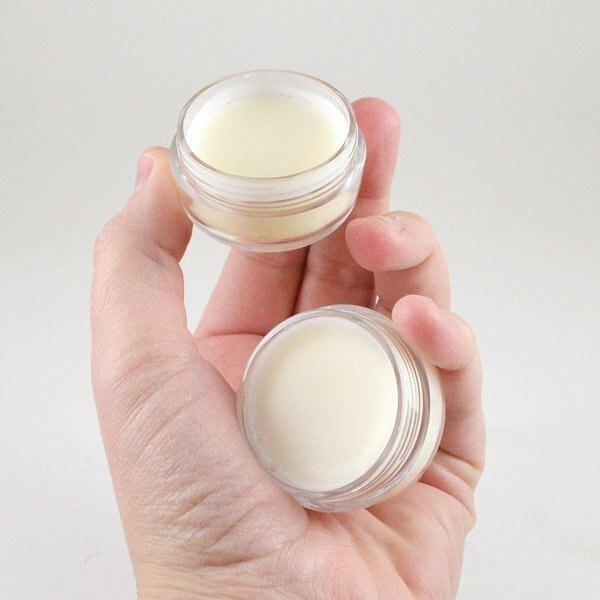 The ratio to make this particular balm, which remember is pretty dense and not really soft, the ratio is one part beeswax to one part coconut oil. For two little pots I used 3 tablespoons of wax pellets. Go ahead and add those to a microwave safe bowl. Zap in the microwave until there are just little remnants of the pellets floating on the top. It will keep melting as it sits and you don’t want to overheat your wax. Now this is already totally liquid. And that is because it finished melting on my walk from the kitchen, where the microwave resides, to my office, where I make crap. 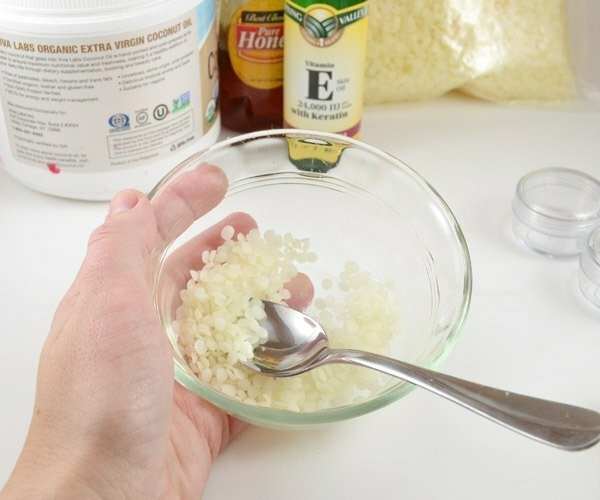 Add an equal amount of coconut oil (up above I suggested 3 tablespoons) to your hot wax. Now if you add it in pretty quickly the coconut oil melts really fast. But I guess mine cooled off a bit on the walk and with picture taking and whatnot. If you have an issue, too, where your coconut oil doesn’t want to liquify on you, zap it in the microwave again keeping a close eye on it. When everything is all liquid-tastic add some Vitamin E oil. I didn’t measure this but I’d say it was probably a teaspoon. My Vitamin E oil isn’t great and it isn’t even 100% Vitamin E. I’d really suggest going with something better than this bottle I snagged at the WalMart pharmacy. 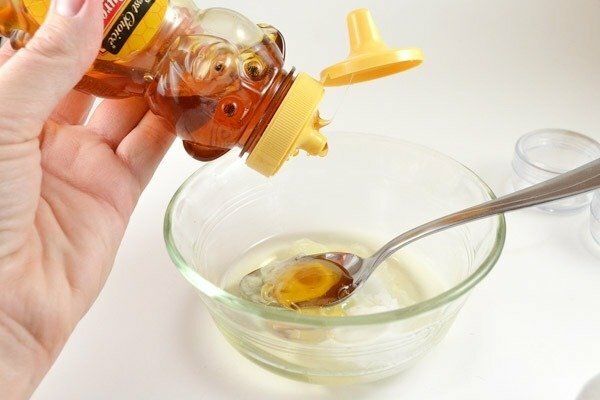 Add about a tablespoon of honey and get that business stirred up! Pour into your little pots and it will start to cool and set. The one on the left was poured first and is already set quite a bit! The one on the right actually has a whole heck of a lot of Campho Phenique in it because this lady gets cold sores every single time she catches a virus or gets wicked stressed out. Yuck! Keep open until the wax completely sets back up. Pick up and check out the bottom to make sure it looks solid and then screw on those lids! The one that is more yellow is the medicated version and you can smell it from a mile away so there is no confusing which one is which! 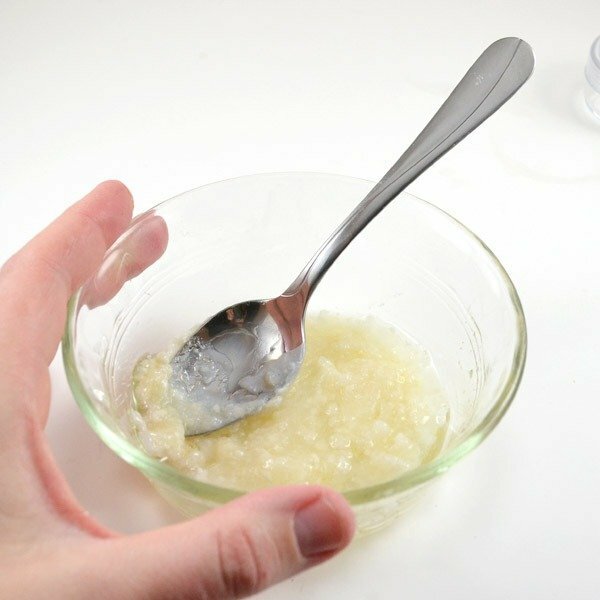 To use you’ll need to rub your finger to warm up and melt the wax (this stuff is pretty darn solid). Apply to your lips and prepare to keep those puppies nice and moist and protected! 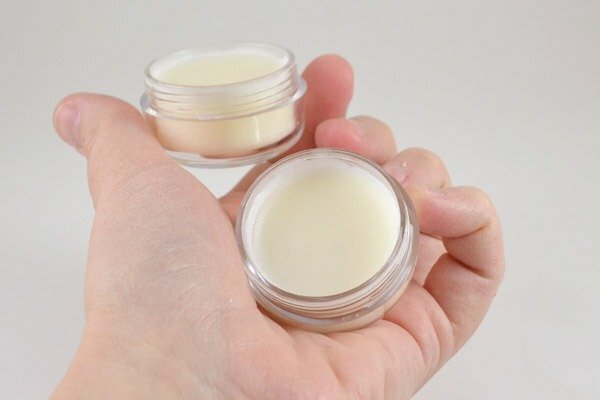 And be sure to come back here to Dream a Little Bigger, because in a few weeks time I’ll also be sharing my fave soft and supple lip balm recipe while keeping it natural! Thank you for this. 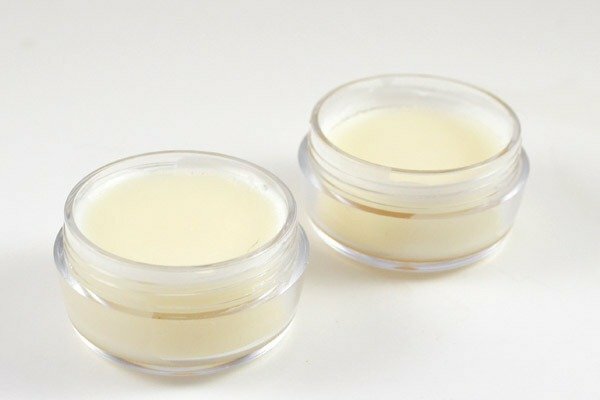 I am thinking about making my own lip balms and lotions. BTW, if you want to cut down on cold sores, add l-lysine vitamin to your regimen. I hardly ever get them anymore since I started taking it. Thanks for the lip balm recipe, I definitely need it this time of year! I sometimes get cracks at the corner of my mouth and I take L-lysine tablets for that and it clears it right up in a day or so. Also, about 3 drops of Melissa Supreme on a wet tea bag applied to a cold sore seems to help. 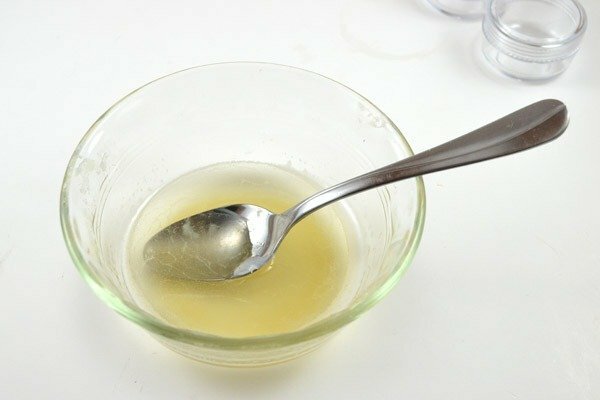 Hello this seems easy.Could you use Almond Oil instead of vitamin e as I dont have any on hand. How to you keep the honey from settling at the bottom? I haven’t had this problem but it looks like it isn’t terribly uncommon. I might suggest whipping the balm with a hand mixer to better incorporate or less honey in the mixture might work better. 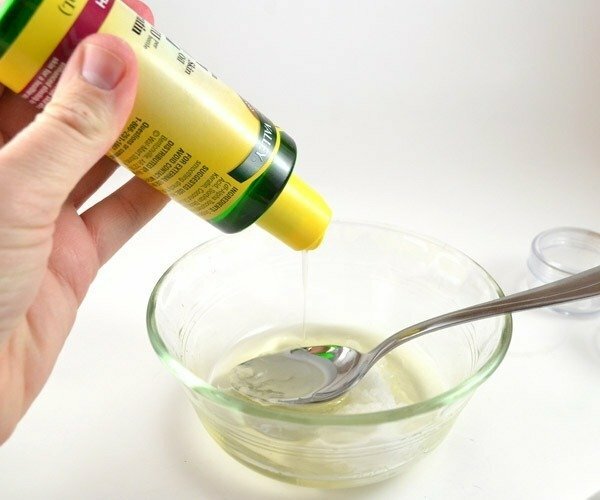 You can also replace the honey with an essential oil depending on what benefit you were hoping to receive from the honey. Tea tree oil or rosemary is good for an antiseptic and you can add some coconut oil for good moisture. Could this be poured into lip balm tubes? Yes, I think it would work nicely in tubes!